REACHING a divorce settlement agreement is largely about dividing marital assets. You’ll negotiate a division of your jointly-owned real estate, stock portfolios, cash and even more unusual assets such as expensive collections of art, wine, antique guns or whatever else you have come to own together over the years. With all that under discussion, it may seem a bit ridiculous to bring up something that seems as trivial as frequent flyer miles. Who cares, right? Maybe it’s difficult to imagine anyone taking a strong stand over air miles, but don’t laugh. Questions like these are very real, and the stakes may be higher than you think. I’ve known divorcing couples to fight intensely about rewards points earned from various travel and credit card companies over the years of their marriage. After all, if one or both of you travels often, especially internationally, rewards points can accumulate significantly before you’ve had time to enjoy the benefits of redeeming them. When you’re talking about hundreds of thousands of frequent flyer miles – well, that can make for some very nice first class travel! So, how exactly do the air miles, or other rewards points, get sorted out? The first step is to check the terms and conditions of your various rewards programs. This can be some of the most tedious reading imaginable, but it can give you definitive answers. Take Marriott’s reward program, for example. It specifically states that points in this program are not transferable to a spouse as part of a divorce. Rather than trying to get around this with a court order, it probably makes more sense to assign a value to those points and negotiate for something of equivalent value in your settlement, instead. Of course, it isn’t always straightforward to estimate the monetary value of loyalty program points. 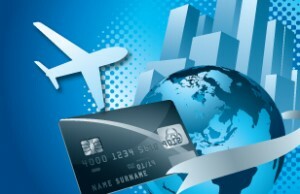 Some travel programs provide a cash value equivalent for their points, but many do not. If yours doesn’t, you may have to do a rough conversion of miles or points into trips or other rewards, and then estimate the value of those. For instance, if an airline requires 50,000 bonus miles to be redeemed for a first class ticket that would cost $1500, you can reasonably estimate $1500 as the cash value of the 50,000 miles. However, that value could vary depending on the destination and time of year. As with most things, you’re best served by being proactive. Do some research and come up with a value that’s both realistic and defensible. Another strategy, if the company awarding the points will allow it, is simply to have the airline or other reward-granting program divide the points equally into two separate accounts. Keep in mind that if you go this route, there will likely be fees incurred for transferring the points and/or resetting their expiration dates. Have a plan for handling these fees fairly. My advice is always to think financially, not emotionally about your assets during the divorce process. I know, I know … Sometimes that’s easier said than done. If you genuinely love a piece of art, for example, it can have value to you in excess of its worth in dollars. But, if your spouse knows that’s how you feel, they can exploit it. I’ve seen spouses develop sudden, intense attachments to objects they didn’t even realise they owned, until noticing their partner hoped to keep them. Trust me, their enthusiasm is not borne of newly discovered appreciation for the art in question. They’re seeing the cash value of these things, and are unwilling to lose out on that. More importantly, if the item is disproportionately important to you, your spouse will see it as a way to get you to give up something else with greater monetary value. Set aside your emotions, and see things in dollar signs, at least for the time being. As impossible as it may seem while you’re in the middle of divorce proceedings, there is other art in the world to love. Don’t let yourself be pressured to make a foolish financial decision, just to keep that one special painting. It can be difficult to set aside emotions with regard to air miles, as well. People can be very possessive of their travel rewards points – especially since, in many ways air travel is just not as much fun as it used to be, we see the bonus miles as a kind of badge of honour for having endured so much of it. If you’re like me, you store up the miles for a time when you can use them for a truly pleasurable trip. It’s something to look forward to, and having that taken away can leave you feeling cheated, or even robbed. But remember, when negotiating your divorce settlement, all air miles and other reward points really do come down to money. If you give up the air miles and make a good financial move elsewhere, you’ll likely find you can still take that special trip you’ve been dreaming of – and you might just enjoy it even more. Pingback: Can you claim a tax deduction for work travel booked with FF Miles?